The best thing about New Zealand is its compact size. An ambitious visitor could experience the grandeur of the South Island mountain ranges and tropical beauty of the far north in the same day. For those who want to take it a little slower, there are hundreds of spots to stop and enjoy in between — here are 10 of the most essential. Te Papa, or Our Place, is the national museum of New Zealand. Its exhibits trace the country’s heritage from the Maori first settlers, through to the worldwide fame of Lord of the Rings and the All Blacks rugby team. Te Papa features an ever-changing range of events throughout the year and is recognized as an innovator and a world leader in interactive exhibits. This makes it a must-do activity, whether you’re in New Zealand for the first time or the tenth. Located on Wellington’s picturesque waterfront, amongst the city’s bustling cafes and restaurants, Te Papa is easy to get to from wherever you happen to be staying in Wellington. It has become the unofficial center of the country and the perfect place to learn more about the history and heritage of New Zealand. General admission is free, which makes it the ideal place spend some time when the Wellington weather gets a little wild. The west coast of New Zealand’s South Island is rugged and spectacular, with mountain ranges alongside windswept beaches. The jewel in the crown is almost certainly Milford Sound. Located in the Fiordland National Park, Milford Sound is known for Mitre Peak, rainforests and waterfalls, fur seal colonies, penguins and dolphins. The most popular way to explore the sound is by boat, with a range of tour operators offering trips throughout the year. Milford Sound is truly one of New Zealand’s most untouched and wildest areas, which means that it is a bit of a drive to get to a major city. Queenstown is closest, roughly four hours away, so make sure you take some time to plan your route or talk to a tour operator. New Zealand is widely regarded as the producer of the world’s best sauvignon blanc, and there are many regions in which to sample the range available. The country has 10 main wine producing regions, with Hawkes Bay, Marlborough and Central Otago being the most well-known. More than sauvignon however, you’ll find complex syrahs, buttery chardonnays and delicate pinot gris throughout the country. New Zealand's wine regions extend 1,600km, from sub-tropical Northland down to cold, dry Central Otago, home to the world’s southerly most vineyards. 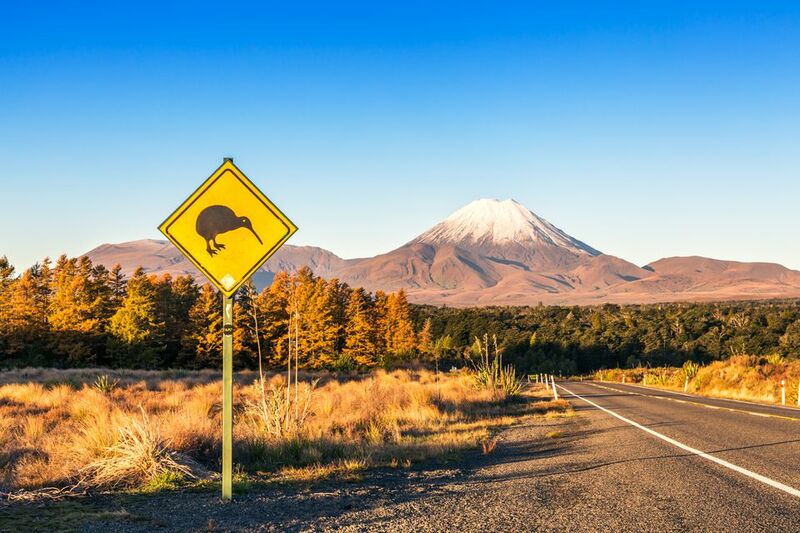 This means that New Zealand produces an incredibly broad range of wines, given the size of the country, and more reason to explore it from the top to the bottom. New Zealand's oldest national park — Tongariro National Park — is both culturally significant for New Zealanders, and awe-inspiring with its scenery. It is home to three of the country’s most well-known volcanoes — Ruapehu, Tongariro and Ngauruhoe — all featuring in The Lord of the Rings trilogy. The Tongariro Alpine Crossing is a world-renowned trek that attracts explorers from around the globe. The area has jagged volcanic rock formations and eerie barren landscapes, with steep climbs and rugged terrain. The Tongariro Alpine Crossing can be difficult in sections, but the spectacular scenery and otherworldly atmosphere of the volcanic wilderness make it all worth it. The park is also home to two of the country’s most well-known ski fields — Whakapapa and Turoa on Mt Ruapehu. The ski season is generally from June to October, and there are accommodation and ski packages available to suit a range of budgets. Modern New Zealand society is based on two documents: the Treaty of Waitangi, the agreement of sovereignty and ownership that defines the relationship between the indigenous Maori people and the British Empire; and the Declaration of the Independence of New Zealand. Both of these were signed at the Waitangi Treaty Grounds in the Bay of Islands. Located three hours north of Auckland, Waitangi is famous for its historical and cultural significance, but is also surrounded by the Bay of Islands’ natural wonders. Swim with dolphins, camp in the warmth of Northland nights, explore the bay by boat - the ways to enjoy this region are endless. You’ll find quaint bed and breakfasts, luxury apartments, and rough and ready campgrounds, with something to suit whatever adventure you plan to have. Two of the most famous events in New Zealand history were the Lord of the Rings and The Hobbit trilogies. A huge factor of their success was the authenticity of the settings, which was due in large part to the filmmakers’ decision to build a real little town for the filming. Complete with warm and inviting Hobbit holes and The Green Dragon Inn, a tour of Hobbiton is the perfect way for Tolkien fans to spend the day. Constructed in the great open spaces between Matamata and Cambridge, in the shadow of the towering Kaimai Range, a visit to Hobbiton isn’t just one for movie superfans. Just short drives from other tourist spots, including Rotorua, Tauranga, Raglan, and the Coromandel Peninsula, a trip to Hobbiton is a great way to see the beauty of the North Island in a short space of time. Whale watching is one of the best ways to enjoy the beauty and peace of New Zealand’s spectacular South Island. Kaikoura offers a rare opportunity to see these majestic mammals up close. Tours are available by boat, plane and helicopter, each giving you a different perspective of the region and everything there is to see. Kaikoura has several species of whale living in its waters, including giant sperm whales, humpback whales, pilot whales, blue whales and southern right whales. Each appears at different times of the years, depending on the season. You may also encounter New Zealand fur seals, dolphins, albatrosses,orcas, and the small, rare Hector’s dolphin. Arguably the country’s most popular tourist hotspot, Queenstown is famous for scenery, extreme sports and nightlife. Outdoor enthusiasts and adrenaline junkies flock to the city to kayak, bungee jump, jet boat, white-water raft, hike and ski. Those in pursuit of less heart-stopping attractions can sample South Island pinot noir from one of the region's 75 wineries, or opt for a quiet cruise through nearby Milford Sound. The city is packed with luxury hotels and great restaurants and cafes, giving you all the creature comforts of a glamorous holiday, with the outdoor wonders of the South Island just minutes away. Queenstown is also one of the world’s leading ski destinations, featuring four international-standard ski fields — Coronet Peak, The Remarkables, Cardrona and Treble Cone. As with all of Queenstown, there are many accommodation and ski packages to suit different budgets, from cheap and cheerful hostels and backpackers, right up to luxury lodges. Waiheke Island sits in the sun-drenched Hauraki gulf, just a 40-minute ferry ride from downtown Auckland. Once a refuge from the hustle and bustle of the city, Waiheke Island has evolved from a relaxed island hideaway into one of the most popular summer spots in the country. It is great for seeing some of the best Auckland has to offer if you only have limited time, or a great place to stay for a few days and enjoy everything it has to offer. The island is crammed with wineries, making it a popular destination for weddings and special occasions, as well as restaurants, cafes and boutique stores. If you’re looking to avoid the shops, Waiheke Island is surrounded by beaches — finding a secluded spot is pretty easy, regardless of whether you choose to ride a bike or drive a car. The island’s size makes it perfect for holidays and escapes of all types. Time in the Coromandel is essential for any beach-loving visitor to New Zealand. The peninsula is packed with much to see and do, from exploring the Coromandel Ranges on The Pinnacles track, to relaxing at Hot Water Beach in your very own, self-dug hot water spring bath. Not far from Hot Water Beach, Cathedral Cove offers one of the country’s most famous sights — the iconic limestone arch that gives the cove its name. The surrounding marine reserve is perfect for diving and snorkeling, and enjoying an underwater wonderland. While the east coast is famous for its surf beaches and secluded bays, the Firth of Thames on the west coast of the peninsula offers calm, quiet swimming and bathing for kilometers. It follows the road past Thames, the main town, and up the coast until it meets with the east side at the town of Coromandel. The Firth of Thames is an important site for shorebirds and gives visitors the chance to see some of New Zealand’s remarkable birdlife.